My name is Jim Bennett. I have a website at jim-bennett.ca with a welcome page, a blog (writing, writers, and politics) and pages promoting my work. I have provided a few references I think valuable to other human beings, and a plug for the charity at which I volunteer. I am a writer, mostly poetry, with previous publishing successes. I have several collections of poetry available on Amazon/Kindle. Selection was taken from poems I have work-shopped and worked on and had validated by "my" group of professional writers. See my website's Available Now page for more. My first Amazon / Kindle book is about death and aging, weakness and coping, hope and despair, and the real human excellence which allows us to rise above our difficulties and love each other, and sometimes even like ourselves. The title poem is Cold Comes Through; there are several poems about my father, whose early death still haunts me. My second Amazon / Kindle book is about relationships. Some non-starters, some OK, some in trouble, some destructing. The title poem is Behind the Lime Kilns, a drama I made up out of various experiences. My third Amazon / Kindle book is called Hard Landing, and is about difficult situations and the individuals in them. I have also added ten salacious limericks and some other just-for-fun pieces to lighten up a bit. You may see yourself, your friend, your enemy in the difficult personal experiences captured in these poems. This one book is not for children nor squeamish adults. 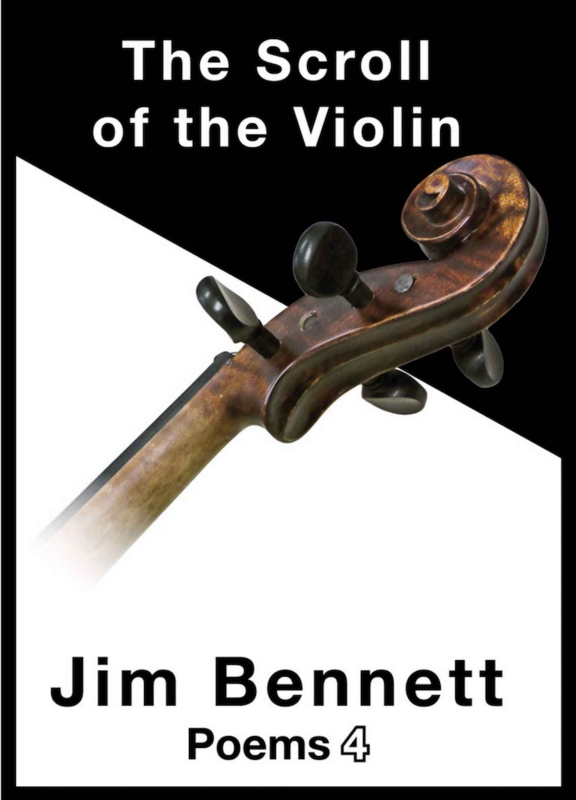 My fourth Amazon / Kindle book is titled The Scroll of the Violin. It is about religion and irreligion, belief and disbelief, trial and error, success, relationships, and joy. What it means to be alive and mortal is explored here. My fifth Amazon / Kindle book is titled Retirement Clock. Some of the poems are a form of time travel: Grand Prix races at Watkins Glen, 9-11 and other disasters (some Canadian), aging and coping, and the cynicism of business success and retirement layoffs. Plus a few poems questioning existence in different ways. What does it mean to come back? from a trip? from an assignment? from a job? These poems will share such experiences with you. My personal interests include biology and religion. I started out with Shroedinger's title question, What is Life, and delved into biochemistry, biology, microscopy. Quantum effects became important so I sort-of understand that (badly). Social effects made themselves noticed, thus a study of Joseph Campbell and Bruce Feiler, on myths and religion. I have read the Koran in two different (English) translations, cover to cover. I do not claim to understand it, but I have a fair idea of what it says. I think. My own religious background is Christian, now highly diluted. Yet I volunteer at a Catholic charity, and load boxes and things onto shipping containers, two mornings a week. I've been doing this for years. I retired early, and can spare that much time for a good cause. I have subscriptions to Scientific American, Popular Photography, and Nature (UK science/research magazine). My head does hurt sometimes when reading the last. I keep tropical fish. I am a photographer of some ability; I've done two weddings (swore never again after the first one, it's work!) but prefer arty outdoor scenes. And travel photos. And anything my wife tells me to shoot: sometimes I execute better than she, but just don't see the opportunities she does. I have degrees from University of Toronto. I worked in data processing for IBM and a large Canadian bank. I was once addressed as Mister Systems Architect by an IBM honcho of Finance Industry Marketing. I was good at what I did. It was interesting and challenging. One thing I learned from development projects is, the product belongs to the client and perhaps the company, but the results of the teamwork, including know-how and mutual respect, belong to the team. Thus my interest in poetry. I've been in the team on Earth for awhile and have come to many observations. Now I am finding ways, in this new and open digital world, of sharing those with others. I want each one of you to have a chance to profit from, recognize yourself in, or laugh or cry, with or at, some of my poems. They were written for us, that is, for you. Note: Jim Bennett has previously published poems in Event, The Fiddlehead, The New Quarterly, and Prairie Fire. Another poem was published by Quest Booksellers Review in conjunction with a review Jim was asked to write for Margaret Atwood's poetry collection, Morning in the Burned House. Another poem was included in Cathy Miyata's book, Speaking Rules! which teaches how to teach young children public speaking. The collection Cold Comes Through contains fifty entirely new poems, as does the collection Behind the Lime Kilns, at 56 new poems, Hard Landing, at 57, the Scroll of the Violin at 69 shorter poems, and Retirement Clock at 54 longer ones. Every book contains entirely new, first-published, poems. Guests on The Rick Lakin Podcast appear in exchange for promotional considerations.